Note: Complete example code for this article is available here. As an Internet user, you take part in many client-server relationships on a day to day basis. Most of these relationships are abstracted away, but what if you wanted to make your own client? Or your own server? Well, if that’s the case then you’ll probably need to know some network programming. What you’re really going to need is sockets. A socket is a receptacle that provides a means of communication between two processes (or in this case, two computers). Basically it allows you to accept or send information on any port you please (so long as they aren’t reserved or already in use). So how are we going to use sockets? Keep reading to find out. Create a socket on a specified port using socket_create_listen. Wait for incoming connections using socket_accept. Read data from the socket using socket_read. Echo the data, and then close the socket using socket_close. Basically this amounts to creating a server, fetching data from a client, and dieing. The code itself is very simple, so take a look. //Create the socket on the specified port. //then print the received message. Notice that I set the port that I want the socket to bind on very high. This generally a good idea, because lower ports are regularly used by other applications. I also have the maximum number of bytes to read set fairly high. I did this to simplify the example. The client for this example is just as simple as the server. It’s going to do the following. Bind to a socket using socket_create. Using the socket that was just created, connect to the server’s socket using socket_connect. Send a message to the server using socket_send. Close the connection using socket_close. //Create a socket and connect it to the server. //Create a message, and send it to the server on $socket. Running the code is easy. Save your server code to socket_server.php and save your client code to socket_client.php. After that, open two terminal windows. 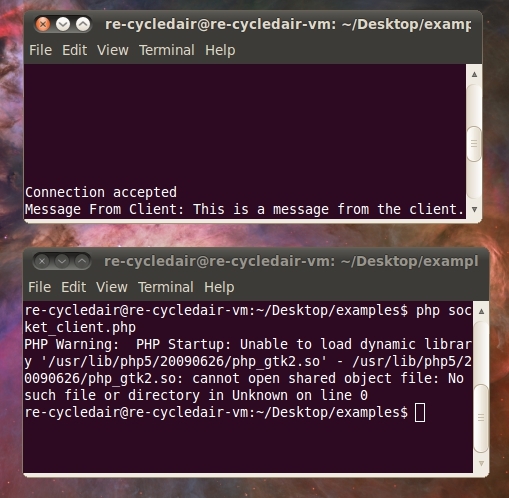 In one window run php socket_server.php and in the other run php socket_client.php. Your output should look like the following image. Please ignore the library error, that’s actually unrelated to this example. Look at the line above it. You’ll probably like these other articles from the Dark Arts series as well.